Director – Steven Spielberg, Screenplay – Jim Hart & Carol Scotch Marmo, Story – Jim Hart & Nick Castle, Producers – Kathleen Kennedy, Frank Marshall & Gerald R. Molen, Photography – Dean Cundey, Music – John Williams, Visual Effects – Industrial Light and Magic (Supervisor – Eric Brevig), Makeup Effects – Greg Cannom, Production Design – Norman Garwood, Visual Design – John Napier. Production Company – Amblin Entertainment. Peter Pan has grown up and is now Peter Banning, a high-flying corporate lawyer, having forgotten about Never-Never Land and his life as Peter Pan. While on a trip to England to visit the 92-year-old Wendy, his two children are kidnapped by Captain Hook. Tinkerbell takes Peter back to Never-Never Land. Captain Hook wants to kill Peter but Tinkerbell persuades Hook to give her three days to get Peter in shape so that he can have a worthy opponent. She must get Peter to rediscover the forgotten child inside himself and learn to fly again so that he can stand up to Hook. Meanwhile, Hook determines to make Peter’s children love him as their father. Before he made Hook, Steven Spielberg had been wanting to remake Peter Pan (1953) for several years during the 1980s – having at one point planned a straight remake with that other eternal child Michael Jackson in the role. Hook, which was originally intended as a Broadway musical, is a sequel to Peter Pan. It is a Peter Pan that seems to have been fed through the deconstruction process and come out posing the interesting question “What if Peter Pan grew up?” [There are many similarities between Hook and the Peter Pan sequel that J.M. Barrie himself wrote entitled When Wendy Grew Up (1908)]. Alas, Steven Spielberg seems bereft of any real answer to this question, his only response being to have Peter rediscovering how to be childlike again. Being Spielberg, the film seems to lack the adult emotional vocabulary to tell the story in any way other than maudlin sentiment. The Disney Peter Pan, for all its faults, at least opened up with a sense of unalloyed pre-adolescent adventure. Hook however becomes bogged down in a Spiebergian mawkishness. A constant theme in Steven Spielberg’s films is that he sees that the greatest possible happiness in life is a happy family – thus, rather than rediscovering his childhood, Hook has the banal resolution of Peter Pan discovering that he has neglected his kids, while even Captain Hook seems to want to become a substitute father. Certainly, when it comes to sentiment there are few who can create images that have such longing emotional appeal as Steven Spielberg – the moment Peter rediscovers his ability to fly is exhilarating, and the images of a young girl singing in a broken-voice about missing her mother or of the tiny Tinkerbell attempting to shade the baby Peter from the rain with a leaf are incredibly touching. As with most Steven Spielberg films, it is very much a case of surrendering to Spielberg’s spell or not at all – and for those resistant to Spielberg, Hook offers more than usual that can be ‘resisted’. Steven Spielberg’s greatest failing as a director is an over-enthusiasm with slapstick – it was something that killed 1941 (1979) and the first two Indiana Jones sequels – and the sequences with the Lost Boys indulging in food fights and manic skate board chases become tiresomely noisy. Hook is a film that often becomes lost in its own size – the production and costume design is so densely textured and colourful that the film almost drowns in it, yet for all that Hook is strangely stagebound. Spielberg never manages to pull back to show any exteriors of Captain Hook’s ship, for instance. One also expected more from the big name actors present. 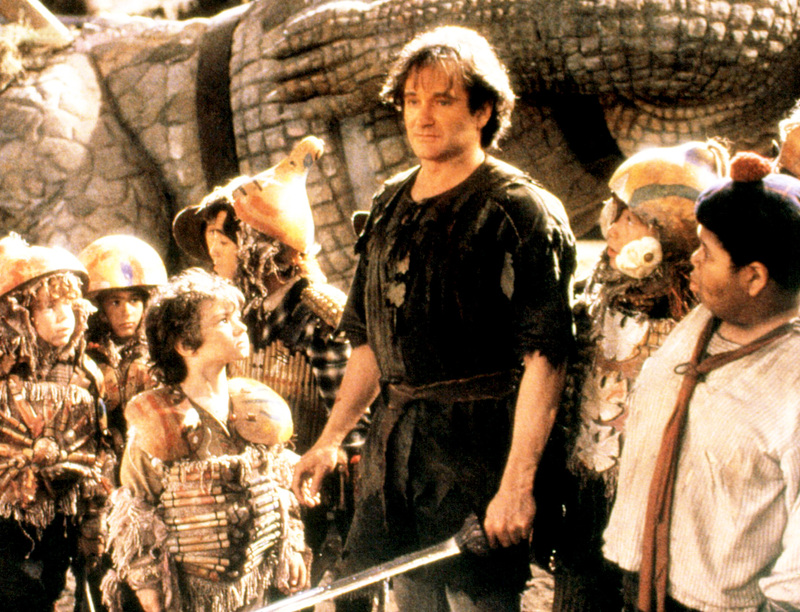 Hook was the beginning of Robin Williams’s descent towards soft-headed family movie mush – and in toning down the manic extrovert personality he was known for up to that point, Williams seems uncomfortably twee. His is not a Peter Pan that seems to bounce with rediscovered youthful vibrance in his step, rather he seems awkwardly roly-poly. 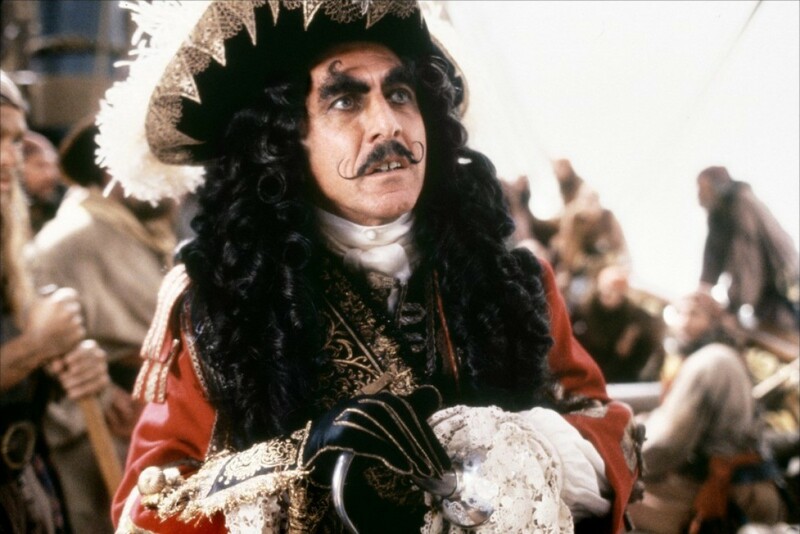 An unrecognisable Dustin Hoffman, who at least does a perfect job of imitating the mannerisms of the Hook in the Disney version of the film, presents too comic a character to hold any threat. The result is one of the usually great Steven Spielberg’s less inspired films. Steven Spielberg’s other genre films are:– Duel (1971), Jaws (1975), Close Encounters of the Third Kind (1977), Raiders of the Lost Ark (1981), E.T. – The Extra-Terrestrial (1982), Twilight Zone – The Movie (1983), Indiana Jones and the Temple of Doom (1984), Indiana Jones and the Last Crusade (1989), Always (1989), Jurassic Park (1993), The Lost World: Jurassic Park (1997), A.I. (Artificial Intelligence) (2001), Minority Report (2002), War of the Worlds (2005), Indiana Jones and the Kingdom of the Crystal Skull (2008), The Adventures of Tintin (2011), The BFG (2016) and Ready Player One (2018). Spielberg has also acted as executive producer on numerous films – too many to list here. Spielberg (2017) is a documentary about Spielberg. Other adaptations of Peter Pan include:- the classic Disney animated version Peter Pan (1953); Peter Pan (1955), a live tv play; Peter Pan (1976), a tv movie version with Mia Farrow!!! playing Peter; the animated tv series Peter Pan and the Pirates (1990); Peter Pan (tv movie, 2000); and the big-budget live-action Peter Pan (2003). There was also the fascinating but little-seen Neverland (2003), which gave Peter Pan a modernised interpretation with Peter a kid suffering from bipolar disorder; and the tv mini-series Neverland (2011), which offered a science-fictional rationalisation set on an alien planet. Other variations of the story include:- Disney’s animated theatrical sequel Return to Never Land (2002) and the series of Tinkerbell dvd-released films with TinkerBell (2008), Tinker Bell and the Lost Treasure (2009), Tinker Bell and the Great Fairy Rescue (2010), Secret of the Wings (2012), The Pirate Fairy (2014) and Tinker Bell and the Legend of the Neverbeast (2014); and the live-action prequel Pan (2015). Finding Neverland (2004) was a biopic about J.M. Barrie and offered a heavily fictionalised account of the writing of Peter Pan.